or just a minor repair to your existing Sky system- we have the solution! 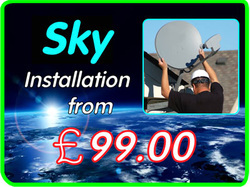 Have Sky turned you down due to difficult access- we have the solution! Looking for a bespoke installation- we have the solution! Need FREE impartial advice- we have the solution! Advice & Quotations are FREE so Why not give us a call! As aerial & satellite installers, we can help you set up the latest Freesat package in your home, ready for you to use the same day. 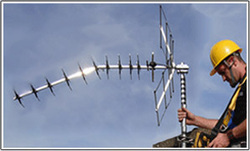 As satellite engineers we will initially check that your area receives a clear line of signal. We will then supply and fit your Freesat dish before setting up and demonstrating how to use the box for channel browsing. If you wish to receive TV in your own language, or maybe you wish to learn another language with help through watching TV in the language you are learning. We have the answers and expertise to guide you to the solution for you. Does your dish need to be moved temporarily? Fancy Upgrading your System, but not sure what to go for? Give us a call, which ever it is we're here to help!